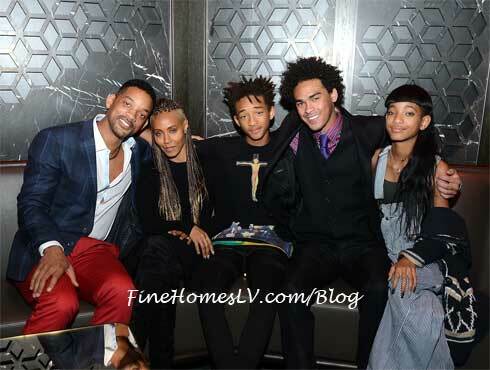 The famous family, all dressed to impress in their own personal style, arrived at Las Vegas’ most buzzed about restaurant just before 8 p.m. and were joined by 50 of their closest family and friends, including Trey’s mom (Will Smith’s first wife) Sheree Zampino who all came out to celebrate their son’s special day. The private dinner took place at Hakkasan’s Ling Ling Lounge as the room was closed off to the public for the event. The energy in the room was lively and filled with laughter as the group dined on Hakkasan signature dishes including the Crispy duck salad, Hakka steamed dim sum, Mongolian-styled beef tenderloin and more. Throughout the evening, Will and Jada were inhigh spirits, rarely leaving one another’s side and were even seen dancing to the DJ’s soulful tracks. The couple even stole a few moments away from the group and were spotted sitting by themselves chatting and laughing. The younger kids, Jaden and Willow, were seen dancing, laughing and taking photos with family members.